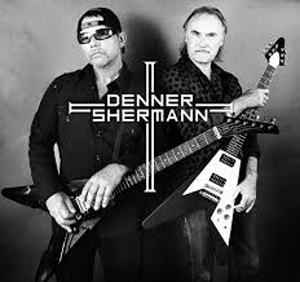 DENNER/SHERMANN, Tthe collaboration of Michael Denner and Hank Shermann, the original guitar players of MERCYFUL FATE's legendary Melissa and Don't Break The Oath albums, have created a new classic in the forthcoming album, Satan's Tomb, coming in 2015 on Metal Blade Records. These songs were crafted with the MERCYFUL FATE worldwide legion of fans at the forefront of their collective minds. From the first riff to the last wail, one cannot help but feel the magic newly recaptured once again. The band calls into service a formidable group of allies who were capable of helping realize this menagerie of malice, was a task carefully orchestrated by these metal mad scientists. Shermann first called upon Marc Grabowski (DEMONICA) to handle the bass guitar, followed by the only drummer that made sense for many obvious aspects, the one known as Snowy Shaw (MERCYFUL FATE, KING DIAMOND, DREAM EVIL). Many voices were considered, but fate lead them to Sean Peck (CAGE, DEATH DEALER). He was not only a fan but had the versatile vocal skills to make the new songs come to life like their fans would expect. Hank Shermann comments: "We have been writing and recording with an incredible line up of musicians and the fans are in for a dark, classic, heavy metal treat for sure. We wanted to get back to the essence of what we created back in the early 80s" "The music inevitable sounds like you would hope it to be, fans of our early work should be very excited". Music for their debut release has been completed, and the title is Satan's Tomb, and promises to be one of the finest pure classic metal releases of 2015. Brian Slagel adds: "I am super excited to welcome DENNER/SHERMANN to the Metal Blade family. I have known Michael and Hank for more than 25 years. I am honored to be able to work with these two legendary musicians. Really excited to work with all the guys on this exciting new band!"